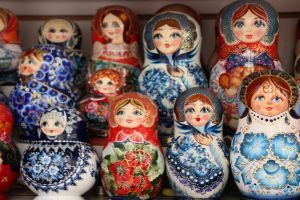 Russian souvenirs are typically inexpensive and well-made, perhaps the best-known among them the wooden Matryoshka, or Russian nesting doll. These are found painted in traditional styles as well as those that bear the faces of celebrities and politicians, sometimes more appropriate as a joke gift or novelty item depending on the source. 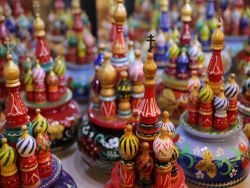 Palekh are enameled wooden boxes that make popular souvenirs, and you can find many street vendors selling their own art. Winter clothing such as coats, boots, and the trademark tall fur hats are plentiful and usually less expensive to purchase than they would be overseas, as well as ice skates and specialty watches previously designed for the Russian military. For edible presents to bring home, Russia produces some of the world’s best caviar– some thought is required before such a purchase, however, as illegally produced caviar is a common and cruel practice throughout the country. Caviar should only be bought from reputable vendors, and customs officials will only allow sealed glass jars no larger than 250 ml. Vodka is an obvious choice, and it can be found in any supermarket at a higher quality and better selection than anywhere else in the world. 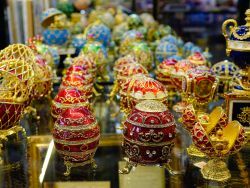 Russian chocolate has a long and delicious history, and one of the most famous brands is Красный Октябрь (Red October), with its famous Soviet-girl-adorned “Alyonka” candy.